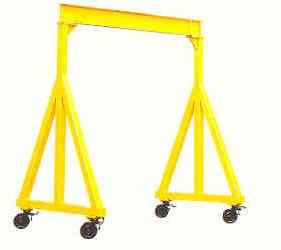 Crane Handling manufacture and supply portable gantry A-frame systems. Our range of mobile gantries are designed to function around you. Whether it be designed to support an electric or manual hoist. 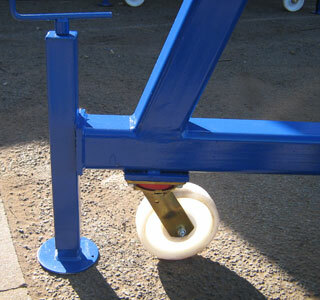 Whether it be fitted with parking jacks or simple brakes on the castors, we can design it, we can manufacture it. Our portable gantry systems are suitable for loads up to five tonnes, suitable for indoor or outdoor usage. Featuring mains isolator and power feed (for gantries holding electric hoists), special paint finishes on request, lockable wheels, parking jacks, hoist (electric or manual), travel trolley (electric or manual). Internally braced mobile gantry- Ideal in confined spaces however runway length is shortened by the bracings being internal. Internally braced with full trolley travel- Ideal in confined spaces and also allows for the full length of the runway beam. Externally braced-Perfectly suited to areas where size is not an issue, giving the full length of the runway for the hoist to travel along. Contact our sales team today for more information on mobile gantry cranes and portable A-fram systems.